6 wheel, 26 tonne, tippers with driver. 4 wheel, 17 tonne, Tarmac insulated lorries with driver. 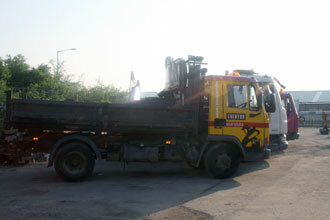 7.5 tonne tipper lorries with driver. Tracked excavators (13 tonne upwards). Mini planer machine with sweeper collector. JCB 3 CX 180 excavator.